Spanish men who refuse to lift a finger around the house are facing new legal sanctions. MPs in Spain have drawn up a marriage contract for use in civil ceremonies which obliges men to share household chores and the care of children and elderly family members. The new law, which will be introduced this summer in Spain, promises a revolution in a country where nearly half of all men admit to doing no housework at all. Puffing and panting and swearing under his breath, 36-year-old Santi Risco tries to put up an ironing board. He doesn't have much success and it's a pretty painful sight watching a previously undomesticated Spanish male trying hard to change with the times. "Spanish law is changing so men have to do 50% of the housework," Santi tells me, rather red-faced. "I am getting married this autumn so I am learning things I've never done before: ironing, cleaning floors and doing the washing up. "It's not that I'm a macho man. It's just that I've never been taught these things before." Santi's trying to make up for lost time. He gives up on the ironing board and heads for the bathroom, ready to clean the mirrors. He is a man with a mission. The contract he will sign at his civil wedding ceremony this September will oblige him - by law - to share domestic responsibilities with his partner. Failure to do so will affect the terms of a divorce settlement, should he ever find himself in that position. But even as Santi cleans up his act, Aintzane, his wife-to-be, says she remains sceptical about the new law. "It's good that Santi is beginning to do things in the house. Well, he has to. I told him about the consequences if he doesn't. But it's not just men. Women in Spain are also part of the problem. "Our mothers tell us to do the housework when we are little girls. So when we go to a relationship we do the housework." So can this "housework law" as it has been dubbed here really change Spanish cultural traditions? Statistics show that Spanish women spend up to five times longer on housework than their husbands. If they have a full-time job, they still do three times more housework. A study five years ago by the Centre for Sociological Investigation concluded that Spanish fathers spent an average of 13 minutes a day looking after their children. And only 19% of Spanish men thought it was right for mothers of school age children to have a full-time job. Margarita Uria is the MP who set up the new law. "It's all a question of education", she says. "Starting with this law, but we should also teach children in schools. Men have to learn to start taking more responsibility in the home and women have to help them do it. This is beginning to change. After all, the Spanish parliament was unanimous in approving this law." At a nearby Madrid bar though, the view shared over a few draughts of beer was that there was little chance of change, law or no law. 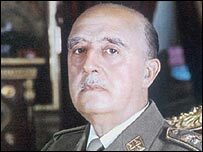 Did General Franco press his own collars and cuffs? "Older generations will never change. Old Spanish machos are set in their ways," says Maria, a shopkeeper. "The younger generations probably will change eventually but because society is evolving, not because of this law." 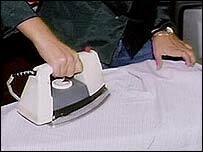 "My husband wouldn't iron a shirt to save his life," says Berta, who described herself as an exasperated housewife. "It's not that he can't. It's just that he won't. He'll never change." Eduardo, a waiter at the bar, says he thinks the law "is ridiculous". "It's up to couples to work out the balance of relationships for themselves," he says. "This law gives the impression that all Spanish men are machos, which we're not." "I already cook at home," says banker Miguel. "I also pick up the kids from school." "Liar!" his wife interjects. "Yes I do," insists Miguel. "There was that time when you had to go to work early and took the children to school..." The couple dissolve in to laughter. "I don't like the new law at all," says Patricia, a schoolteacher. "I love macho men. They are more masculine and I don't care about doing some housework." A number of women's rights groups in Spain say they oppose the housework law because it belittles the issue of sexual equality, making it laughable. Almudena Rodriguez del Llano, a spokeswoman for the group Women for Democracy says: "This law is ridiculous and impossible to enforce. "What is a woman going to do if her husband doesn't help her at home? March to the local police station and report him? You can just imagine the expression on the faces of the officers on duty, can't you?" But while the law has been criticised by some, it has inspired others. 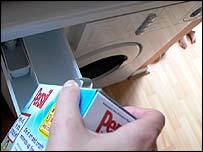 The Barcelona-based inventor, Pep Torres, has designed a washing machine called Your Turn. It uses fingerprint technology so that it is impossible for the same person to use it twice in a row. The idea, he says, is that men will be forced to share washing duties with their partner. And Pep has not stopped there. He has also come up with a cunning idea to persuade even the most macho of men to do the ironing - heavy weights hanging down from the iron. Every time you sweep the iron across the board, you build some fabulous muscle! "Basically my aim was to stop macho men sitting around the house doing nothing except drinking beers," says Pep. One man who has already put down his beer and put on an apron is Santi. Hard at work at the kitchen sink and with Aintzane keeping a watchful eye, I found him practising his new marriage vows: To love, to cherish and to do the washing-up.